From visionary filmmaker Bong Joon Ho, the creative mind behind the worldwide sensation Snowpiercer, comes the new global adventure Okja. The film follows the epic journey of Mija, a young girl who must risk everything to prevent a powerful, multi-national company from kidnapping her best friend, a massive animal named 'Okja'. The Netflix original film stars Tilda Swinton, Jake Gyllenhaal, Paul Dano, Giancarlo Esposito, Steven Yeun, Lily Collins and newcomer Seo Hyun An. Okja will premiere exclusively on Netflix on June 28. 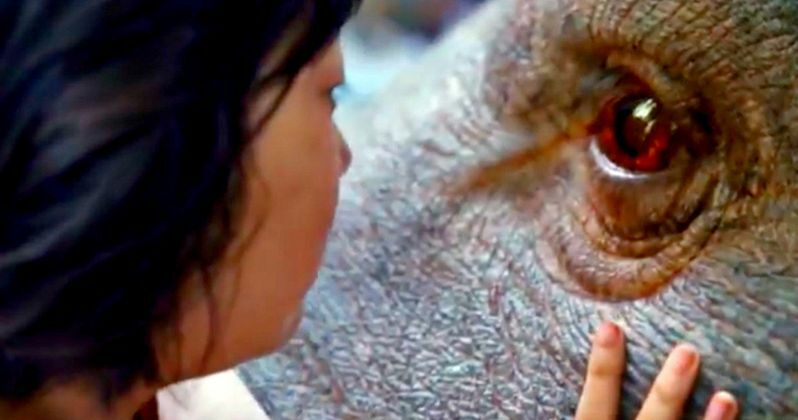 This first teaser only gives us a glimpse at Okja and his best friend. We also get to see Tilda Swinton as the ominous creator behind this strange and fascinating creature. From visionary Director Bong Joon Ho, this grand global adventure follows a friendship too big to ignore. Meet Mija, as you follow her across continents, in this coming-of-age comedy drama which sees Mija's horizons expand in a way one never would want for one's children, coming up against the harsh realities of genetically modified food experimentation, globalization, eco-terrorism, and humanity's obsession with image, brand and self-promotion. Related: Real-Life Sea Monster Washes Ashore in Indonesia, Is It an Alien? Okja follows Bong Joon Ho's international hit Snowpeircer, which received worldwide critical acclaim after Ho made a name for himself with the unique and revered monster movie The Host. But when it comes to the massive animal at the center of Okja, Bong is quick to clear up any confusion. This isn't another monster movie, even if the title character is a mysteryous creature. He had this to say in an earlier interview. "It's a very shy and introverted animal. It's a unique animal that we've not seen before." In the movie, Mija and Okja go on globe spanning quest that eventually leads then into New York City. The fantasy adventure thriller will have a story that once again revolves around politics. Joon-ho is known for bringing in very political elements when it comes to his past movies and this won't be any different. He goes onto say this. "Red is part of a group of animal rights activists that figure into the story," said Joon-ho, who filmed in the Financial District. On Wall Street, it's the heart of capitalism. On the surface is a story about an animal, but it's essentially a story about capitalism." The production of Okja got quite a lot of attention for casting Walking Dead star Steven Yeun. At the time, Yeun was coming off the Season 6 finale of his hit show, which teased a member of the Alexandria crew dying, turning it into one of the biggest cliffhangers of the TV year. Many believed Yeun's Glenn would be the one to die at the end of Negan's bat, because his casting was announced Okja as Walking Dead Season 7 started production at the same time. As we know now, Glenn did die in the Walking Dead Season 7 opener. But it looks like Yeun has some more exciting projects in the works. Take a look at this exciting first teaser trailer, coming to Netflix this summer.